This dog came running up the hill barking at me, shattering the quiet dawn as I shuffled past grape vines loaded with fruit. Light was pooling in the east behind Mount Jefferson and Mount Hood, the sky was clear and deep blue and black, and I was suddenly trying to find a spot, any spot, on the side of this hill to make a picture. I had little idea of where I was and I suddenly had that feeling that I was going to miss it all. And this dog, he didn’t seem to want me there. Then he, or she, approached and we touched and everything was fine. 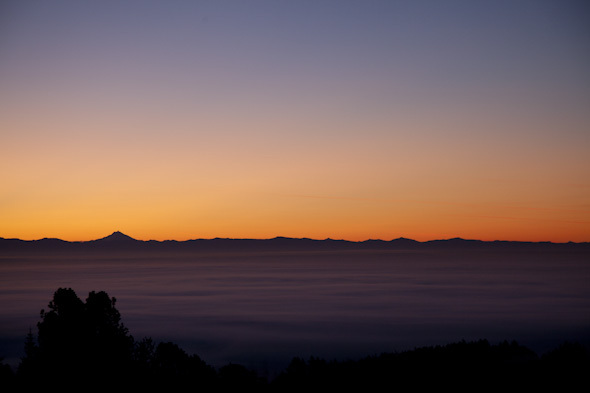 We stayed together for the next hour watching the sun rise over the Cascades. There was thick fog in the valley and frost on the grass under our paws. My new friend snatched a cluster of grapes and sprinted off down the narrow road and I was alone again. This entry was posted on Friday, August 31st, 2012 at 12:06 am. 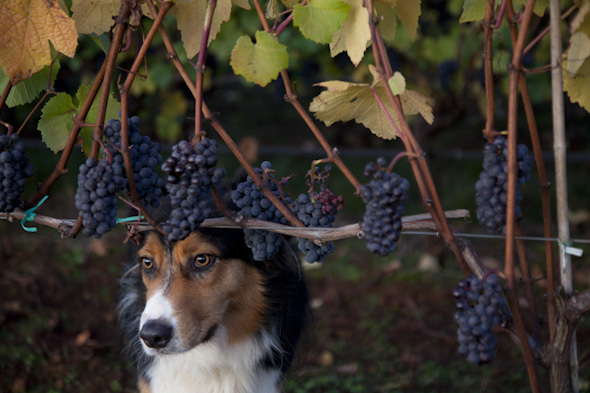 It is filed under assignments and tagged with country, dog, labarge, oregon, photography, portland, vineyard, wine. You can follow any responses to this entry through the RSS 2.0 feed.